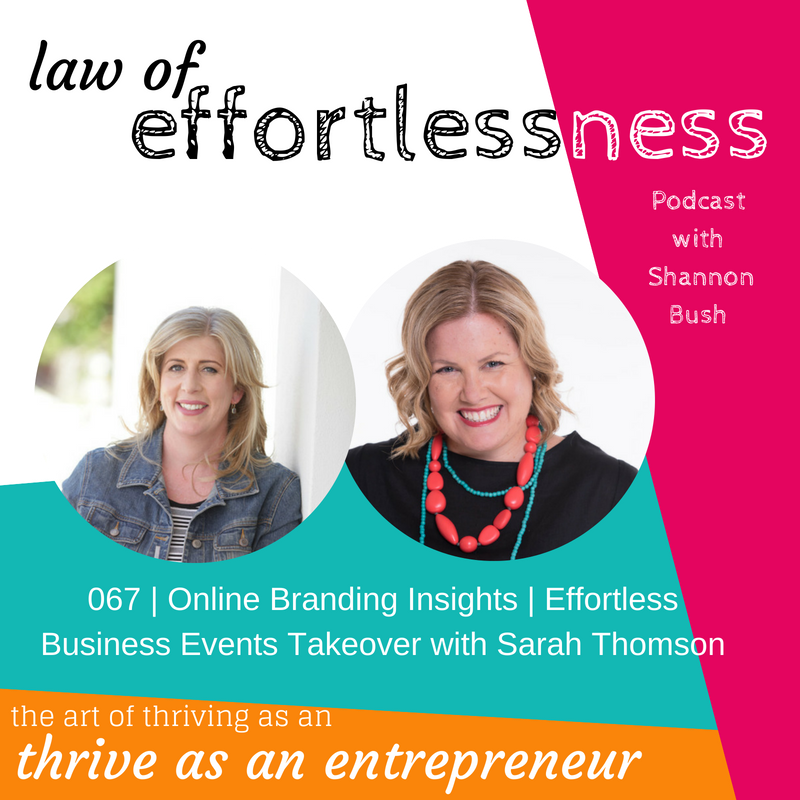 Welcome to another installment from the Effortless Business Events team on Law of Effortlessness Podcast Take Over with your hosts, Business Coach Shannon Bush and Marketing Super Star, Sarah Thomson – this time chatting about Online Presence, something that is critical to your digital marketing success. This episode is a juicy one – the who, what, when, where, and why of online presence from privacy to perception and expectations. So, why is checking your online presence as a small business owner so important? Shannon and Sarah discuss why its so important to have an online presence and to curate it and be aware of what is out there online about yourself personally, and your business. For example, you’ll do well to understand the variations on a basic Google search with images, videos, and variations of your name (especially if your name has ever changed). It’s also essential to be aware of your privacy online – as Sarah says, just because a group on Facebook is private or secret, does not mean people have not taken a screenshot of your post! Filled with practical, effortless tips that you can immediately implement in your own business and life, Shannon and Sarah also discuss the expectations and perceptions that often come from what we share with our online presence, whether its our personal profile or business profiles on Facebook or LinkedIn, and walking the line between being comfortable with what you share with many people. The ladies talk through what you choose to keep private drawing on Sarah’s experience with a client who holds very different beliefs on a hot-button issue, and how she chooses to engage with them and keep her own views private with careful curation of her Online presence. So, what expectations is your online presence setting for potential customers who see you online? Enjoy the episode! Find out more about Market 2 Thrive here. This entry was posted in Business Success, Business Wisdom, Effortless Success, LOE Podcast, Magnetic Marketing, Marketing, Small Business and tagged Business, Business Coach, Business Coach Perth, Effortless Business Events, Law Of Effortlessness Podcast, marketing, Marketing Coach, marketing coach perth, Online Business, online marketing strategy, Online Social Butterfly, Sarah Thomson, Shannon Bush, small business on August 21, 2018 by Ashleigh Rae. 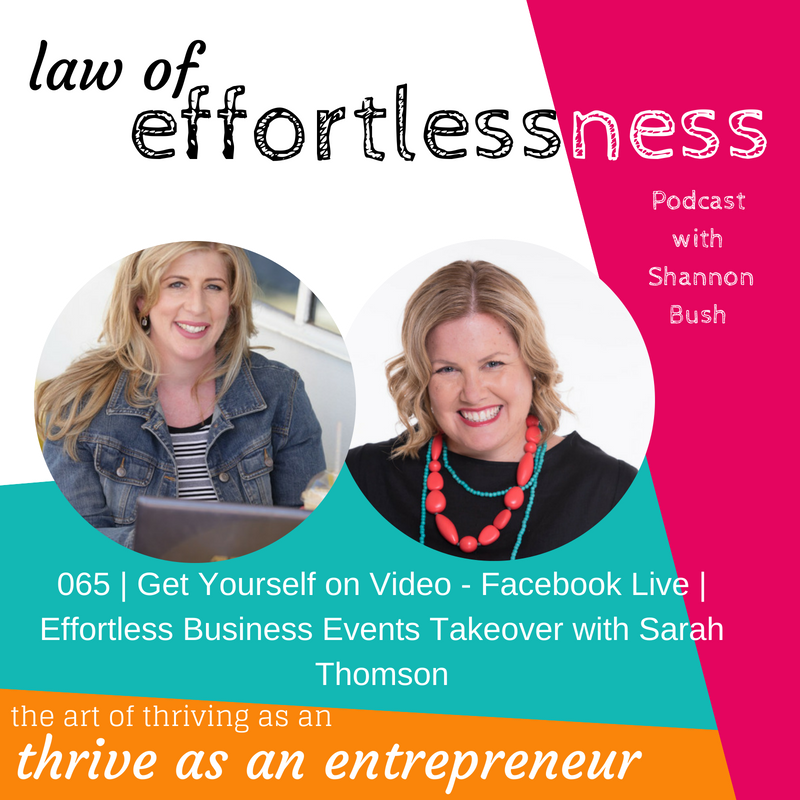 Welcome to another installment of the Effortless Business Events takeover of the Law of Effortlessness Podcast with your hosts, Shannon Bush and Sarah Thomson, continuing the conversation on all things Facebook video marketing for your business! In this episode, number 65 on the podcast, Shannon and Sarah take a deeper dive into video marketing. The ladies talk specifically about the impact of mindset when it comes to video marketing or your business, with common fears of giving too much away. They also talk about what to talk about and share basic simple etiquette rules your viewers will appreciate. Want to know what equipment to use? they’ve got that covered too with a talk through the equipment you do and don’t need to get started with video. Lastly, you’ll hear about the incredible and real results Shannon and Sarah experience as a result of using Facebook Live in their businesses as a video marketing tool. You’ll hear about the relationships it helps to build and nurture, as well as an increase in Facebook Likes, Follows, and reach with, as always, simple and easy things you can implement in your business right away and begin to see a great benefit from! So, what are you waiting for? It’s time to do a Facebook Live! 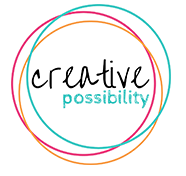 This entry was posted in Business Planning, Business Success, LOE Podcast, Marketing, Mindset, Small Business and tagged Business, Business Coach, Business Coach Perth, Effortless Business Events, entrepreneur, Law Of Effortlessness Podcast, Marketing Coach, marketing coach perth, Sarah Thomson, Shannon Bush, Video Marketing on August 14, 2018 by Ashleigh Rae. 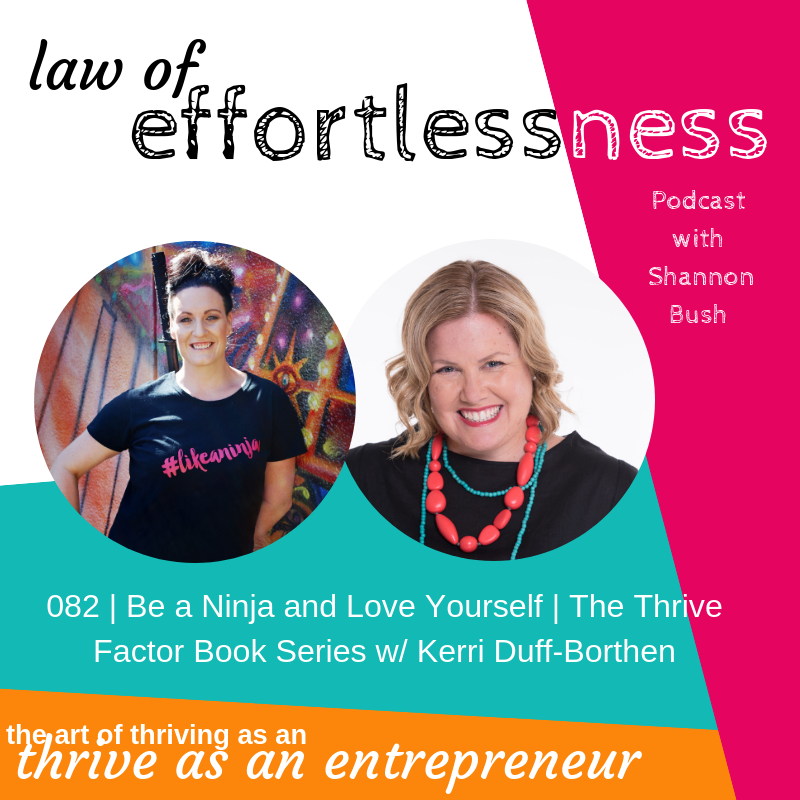 Welcome to another Effortless Business Events takeover of the Law of Effortlessness Podcast with your hosts, Shannon Bush and Sarah Thomson from Online Social Butterfly. Shannon and Sarah teamed up around a year ago to form a collaboration and in March 2018 hosted their first 2 day marketing conference in Perth, Market Like You Mean It. This October they are back with a new offering for Perth small business owners but this time it’s the digital edition covering all aspects of digital marketing. 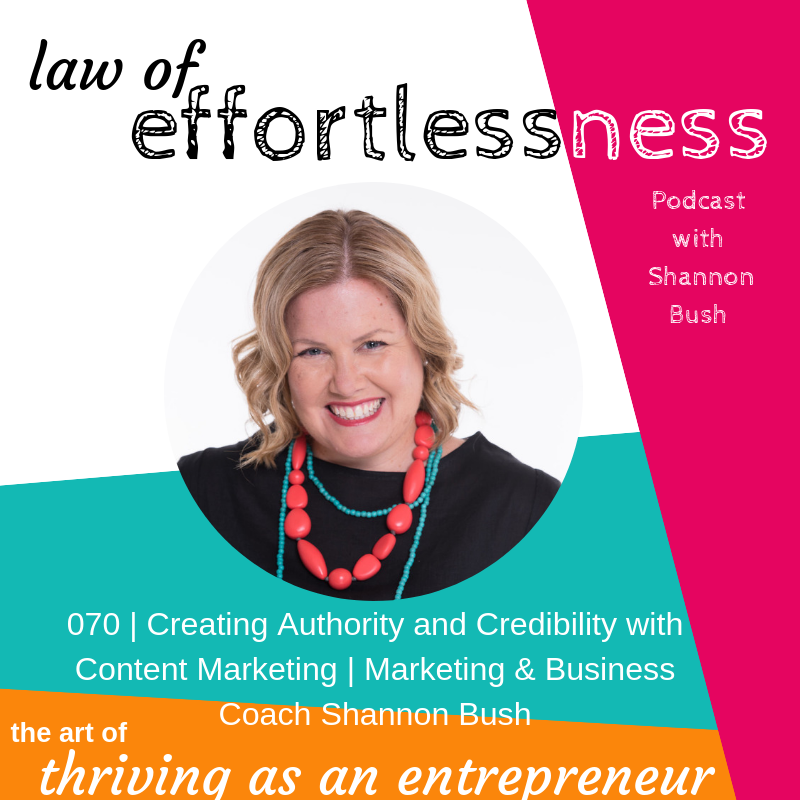 In this episode, the first of 4 in their take over of Law Of Effortlessness Podcast Shannon and Sarah chat all things Video Marketing in your business. You’ll hear Sarah share some incredible predictions for the next five years and hear the ladies chat about why you need to be using video marketing in your business more often. This entry was posted in Effortless Success, LOE Podcast, Magnetic Marketing, Marketing, Mindset, Small Business and tagged Business, Business Coach, Business Coach Perth, Effortless Business Events, entrepreneur, Law Of Effortlessness Podcast, marketing, Marketing Coach, Video Marketing on August 7, 2018 by Ashleigh Rae.